Faxe Kalk A/S of Denmark has ordered a Siwertell 5000 S mobile dry bulk ship unloader from Cargotec to handle calcium oxide at 130 tonnes per hour. The minerals company takes delivery of the screw-type unloader in June, and will use it at the ports of Faxe Ladeplads and Vejle, which are 235km apart. 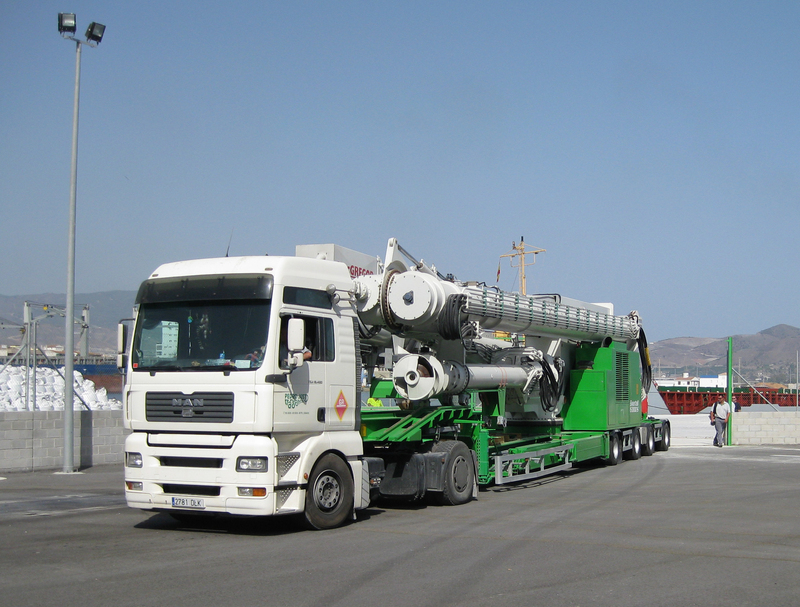 Mounted on a semitrailer the Siwertell 5000 S is fully road mobile and suitable for vessels of up to about 5,000 dwt. "The equipment can be unfolded and ready for operation just 30-45 minutes after arrival at the unloading site," says Jörgen Ojeda, Cargotec's director for mobile unloaders. "It is possible for one person only to unfold or fold-up the unloader on their own". Faxe Kalk's trailer-based unloader is diesel-powered and features a dual-bellows system, which can be operated via wireless remote control or by using a pre-programmed automatic shifting function. "This will be the first unit to benefit from the remote control of not only the unloader itself, but also of the bellows system. We have used remote control systems on unloaders for many years, but the option of using either wireless remote control or the automatic shifting function for the bellows system is a new feature for this product," Mr Ojeda says. "The customer chose this particular system from Cargotec because it needed a mobile unit with well proven technology. The bellows' control system with automatic shifting, which allows continuous unloading to trucks, was also a factor in the decision making. 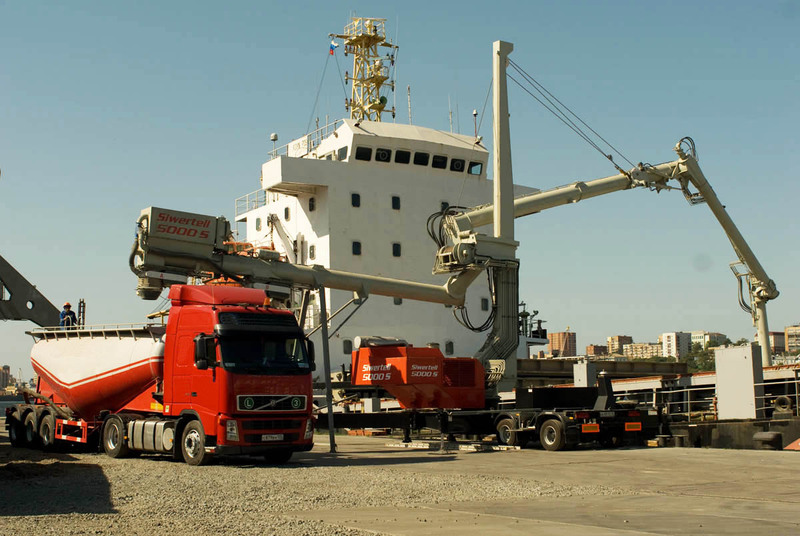 "There are now about 100 Siwertell continuous, screw-type road-mobile ship unloaders in use worldwide, typically handling commodities such as cement, grain, derivatives, fertilisers and alumina. "Another recent example is a trailer-based Siwertell 5000 S delivered to Cementos Molins Industrial SA in Barcelona at the end of 2009. In this case the equipment is used to handle white cement at 300 tonnes per hour. Factors influencing this customer's choice of equipment included the dust-free nature of the mobile system and Cargotec's unrivalled experience in this technology". Cargotec offers three versions of mobile Siwertell unloader: the 15 000 S and 10 000 S models as well as the 5000 S. Unloading capacities range from about 200t/h up to 550t/h. All can be mounted on a semitrailer, a pontoon, a travelling gantry or fixed on a pillar. A trailer-mounted 10 000 S is designed for ships of up to about 10,000 dwt, and a trailer-mounted 15 000 S for ships of up to about 15,000 dwt. All trailers can be moved by road. Stationary and gantry-mounted 10 000 S units are suitable for ships of up to about 15,000 dwt, and 15 000 S units for ships of up to about 20,000 dwt.